one of the most important. 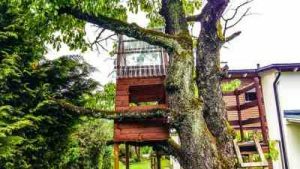 Whether the tree house is intended for kids or adults proper construction is important as a structure badly built could collapse without warning. Before commencing consider these few issues. What size do you want the structure? Is it for the kids only? Is it a playhouse or for watching birds or animals? Is it an adult get away? Do you want it to be easily seen? Will you be using the existing trees or a structure from the ground? You may even want to consider the direction of the sun at various times of the day. Before you start you need to plan carefully. To help you choose the right plan that is safe and step by step try us and we can help you find plenty of plans to choose from. The most common material used for a tree house is wood. It is stable and can be lightweight if carefully selected. Start by choosing the tree and branches you will be working with and ask an expert if necessary if it is suitable. It is necessary to have blueprints of a plan so you can guarantee the structure will be secure and safe. Once you have ascertained the right tree then a platform is usually the first construction. Make sure it is strong enough, level and doesn’t swing. If you have a large floor area then you may need to construct it on the ground and pull it up the tree to attach into place. When considering the roof you will need to ensure it is of lightweight materials. As long as it prevents rainwater leakage and withstands the wind you are all right. There are various materials to choose from. The choice is yours as to whether you put doors and windows in. It will also depend on whether anyone is going to be spending a night in the tree house. Perspex glass is usually used for the windows as it doesn’t break as easily as normal glass. Even flaps may suite your tree house. Finally, how are you going to reach your tree house? The options are endless. Some suggestions are a rope ladder or even a more substantial metal or wooden ladder and attach it to the trunk of the tree. Safety is the main issue here and if the children are small then a soft padding material directly below the entrance may be necessary. All children love playing in a tree house and just imagine the enjoyment you will have watching your children play in something you have made yourself. If made sturdily a treehouse will last a long time.